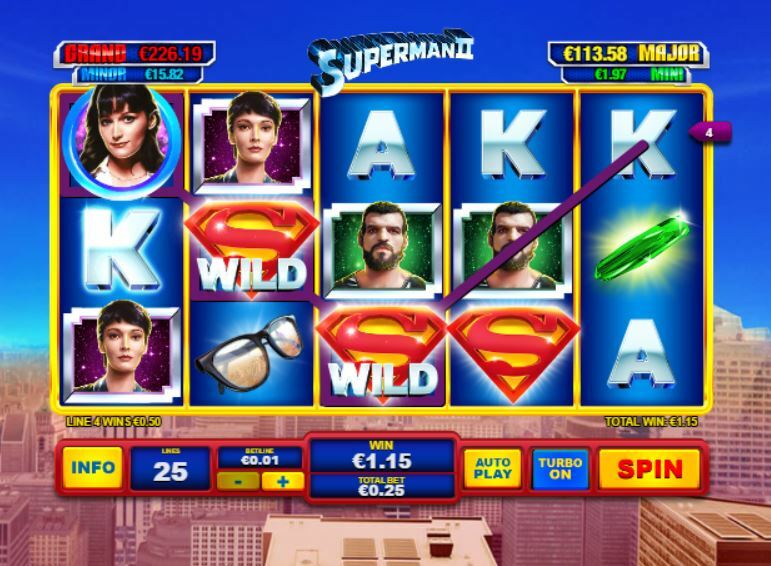 Superman 2 slot is yet another DC Comics trademark slot from the Ash Gaming/Playtech stable. The other versions like the Batman series including Riddler Reels, Mr. Freeze Fortune and Catwoman Cash have varying levels of playability and mechanics that will satisfy the player - or not. Superman 2 or 'Superman II' as it is commonly written is a reference to the 1981 movie, which brought the world the three villains from Krypton, lead by darkly-cruel General Zod (superbly played by Terrence Stamp). So have Playtech made good use of the Superman rights in this case? 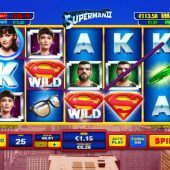 You get 5 reels with 25 pay lines and there is the musical soundtrack from the Superman 2 film in the background and suitable Superhero noises when you win. Superman is the highest paying symbol at 40x stake for 5-of-a-kind and naturally his arch-enemy General Zod appears as a picture symbol along with his beloved Lois plus 2 more villains. The card symbols pay the lower awards at 2x stake for the lowest J and 10. All the features are accompanied by scenes from the Superman 2 movie which is a pleasing addition! Battle for Metropolis - pick a Superman symbol to reveal a cash prize or 'collect'. You may pick an 'X-Ray' too which automatically picks the best hidden cash award. Any Kryptonite revealed awards a life redeemed against the 'collect'. Complete all 10 levels and you get a big award at the end! Phantom Zone Spins - unlimited spins with a floating 2x2 Phantom Wild stopping randomly each spin. There is a scrolling window at the bottom which will stop on either a 2x or 3x multiplier for that spin, a clock which ends the spins or a Superman logo which will add a life and prevent the next clock from ending the round. Skyline Fight Spins - You start with 10 spins but a special Superman symbol on reel 3 stops the spins counting down if it lands. While the counter stops, if it lands again it adds a multiplier up to a maximum of 5x. Unfortunately Zod can land too on reel 3 and he will remove any multipliers and start the spins counting down again. X-Ray Vision Spins - 15 spins in which if the 'X' lands on reel 3 it will add 1 Wild to both reels 2 and 4 as well as being wild itself. Like all these bonuses, no retrigger is possible. Lois And Clark Bonus - a pattern of 30 Superman logos is picked from and once you've picked 5 the same and thus filled a bar by one of 4 different awards, you get that prize. Top is 100x stake, second 50x third is 20x and lowest is 10x stake. You can however pick 2 special tiles, one doubles all the prizes and the other adds one pick to all 4 progress bars. Superman 2 slot also has the Marvel DC progressive jackpots, 4 levels from Mini to Grand which can be randomly awarded on any spin.